If there’s one thing the Palmetto State knows well, it’s food. The vast amount of restaurants, bars, cafes, and foodie events prove it. And with the Southern passion for all things edible comes the appetizing idea of letting someone else handle all the sourcing, prep work, cooking, and cleanup for your big events. The next time you’ve got a crowd to please, try one of these 10 best catering services in South Carolina! If you want to partner with a catering company that will work just as hard as you are to make your event a success, you owe it to yourself to join forces with Wild Thyme. From corporate events to weddings and holiday parties, you can expect nothing short of a highly professional staff that’s ready and willing to go the extra mile and beyond to ensure your guests are delighted with every bite. Call ahead to schedule a free tasting before you decide on your menu! European flair meets the finest in Southern dining. The folks at Applause take care to plan each menu tastefully to ensure there’s something that appeals to every palate. Their service spans the full gamut of catering, including setup, cleanup, table decor, event design, and bar services. In other words, they handle the details so you don’t have to. This family-owned full service catering company is well established in the Charleston community, having planned and managed events since 1979. They can offer assistance in renting event equipment, planning menus, beverage service, and managing all the logistics so you can spend more time enjoying your event and less time wondering who’s going to clean up the mess when the party’s over. The folks at Dupre understand the entire success of your event can hinge on the taste and quality of the food, along with the service of the staff. That’s why you can rest assured that you won’t have to worry about any of these things when Dupre is on duty. They offer their own unique venues and know how to deck them out to their fullest. This team puts hard work and dedication into every event, and their passion shines brightly by producing only top quality food creations, ambiance, and service. If it’s presentation you want, look no further than the catering artists at Salthouse Catering. They embellish every dish they create with fine details that know how to make a statement. Their stunning array of food and beverage items, combined with integrated decor that complements the event’s overall ambiance, is nothing short of amazing. In fact, their culinary designs look so good you almost feel guilty eating them… almost. A team of professional chefs combine their culinary skills to transform your event into an edible work of art. From creating ice sculptures, chocolate fountains and cakes to main courses and fruit displays, your guests will marvel over the unique experience and well-planned details long after the party stops. If you are looking for truly custom catering options, then you deserve the Good Life. They meet with you one-on-one to discuss your event and tailor a package just for you, rather an opting for an easier one-size-fits-all solution. From providing decor and live music to planning food and beverage menus, Good Life has you covered. This husband-and-wife dynamic duo puts their passion for food and people to work in their Lowcountry catering business. 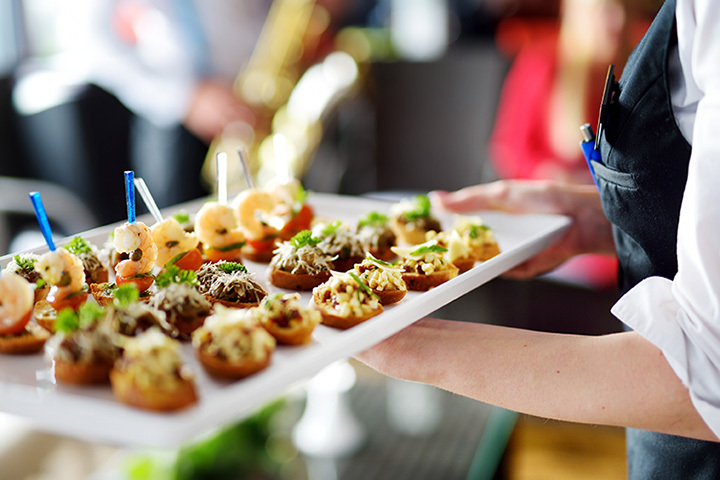 Having catered for high profile events like the PGA Tour and NASCAR championship, they can handle an event any size great or small with a delectable menu to match. Reeves Catering’s trump cards are many, such as focusing on each event on an individual basis and preparing delicious dishes for your guests. But it’s their commitment to the people they serve that truly makes the difference. From planning special diet menu items, such as vegan and dairy-free, to learning more about you and the people attending your event, Reeves takes quality and perfectionism very seriously, and it translates in the stunning response from their previous guests. The Knot, a wedding planning website, awarded Bagatelle twice with “Best of Weddings,” accolades. The menus at Bagatelle are dynamic, allowing them to supply delicious feats for all kinds of events. They offer a Thanksgiving Feast menu, a Holiday Feast selection, and a St. Patrick’s Day Celebration Menu. You can also order from their impressive hors d’oeuvres menu. You can’t go wrong with Bagatelle.